Our adventure began in Bogota, Colombia. We arrived at 8p.m., and were completely lost. Not one of us knew much Spanish, and it was starting to occur to us that we didn’t have the trip as planned out as we had thought. Thankfully, Colombians are extremely welcoming, and a flight attendant noticed three gringas and a colorful gringo looking very lost and came to our rescue. She took her phone out of her pocket and called two of her friends, a couple who happened to be tour guides. They met us downstairs and saved us from the myriad of taxi drivers pulling at our luggage to try and get us to take their taxi. From there, they took us to a cheap but nice hotel, where they were to meet us at 7a.m. the next morning to show us around the city. The next morning, we met them downstairs and they took us to get breakfast before starting our day. Our first stop was Monserrate, an iconic mountain in the center of Bogota that you can’t miss. On top of it sits a church and a monastery, built in 1657. Posing with the the Serrato’s outside of Monserrate. If you only have a few hours in Bogota, I highly recommend going to Monserrate above anything else. Not only do you get some amazing views of the city, but you get to ride a fun cable car up to the top of the mountain for only 14,000 pesos (about $5)! Next on our tour was the city center. Here, we explored the Bogota Cathedral and chased pigeons in Bolivar Square. After running around trying to make them fly (with no such luck) we decided to head to the gold museum. Colombia has a rich history, and the museum displays pre-Colombian pieces from over 8 different cultures. The entry fee into the museum was 3,000 pesos (approx. $1), and it contains some pretty baller jewelry, gold shaman masks, and interesting profane sculptures. We aren’t very big on museums, as we’d rather spend our time outside, but we highly recommend walking through at some point during your stay in Bogota. As our flight neared closer, our guides took us to lunch and we walked around for another hour, spotting lots of street art on every corner. Beautiful street art in Bogota’s city center. 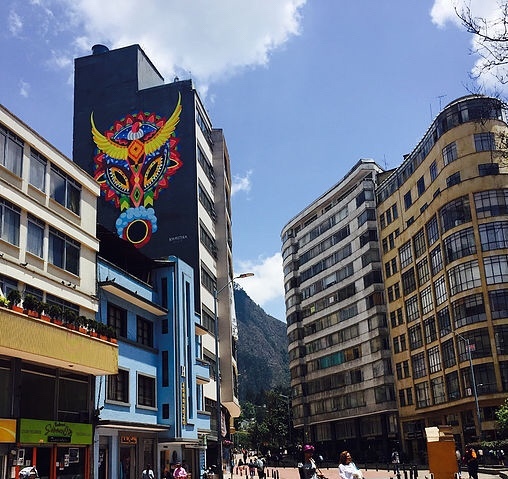 Bogota is a very vibrant city. From the people to the buildings to the surrounding landscape, the colorful surroundings jump out at you yearning to be noticed. We loved Bogota, in fact, it was a highlight of our trip to Machu Picchu. Many people veer away from Colombia, as it is seen as “unsafe” to many tourists. However, as long as you keep your wits about you and don’t go off alone to explore at night, we found it to be a safe and welcoming city. Wanna purchase a guidebook for your upcoming trip to Colombia but not sure which one to choose? We recommend this one by Lonely Planet!